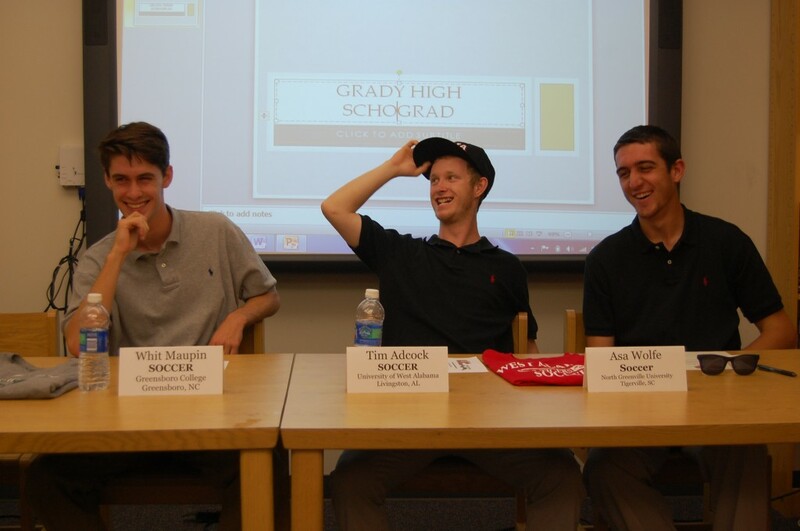 A GRADY HAT TRICK: Graduates Whit Maupin, Tim Adcock and Asa Wolfe joke around as they each sign commitment letters to their colleges of choice. All three athletes have played club soccer since they were 5 years old and have played on the varsity team since they were freshmen. Photo by Joe Lavine. Three colleges received strong additions to their soccer programs on Friday by locking up the commitments of three Grady soccer stars. Asa Wolfe signed to North Greenville University, Tim Adcock signed to the University of West Alabama, and Whit Maupin signed to Greensboro College. All three athletes have played soccer for 13 years, and they all look forward to advancing their sporting careers in college. Adcock is thrilled to have the chance to play soccer at the University of West Alabama. Sometimes it is tough for athletes to adjust from a high school level to a collegiate level, but Adcock is confident he will be able to make the transition. Maupin says he is very excited about playing at Greensboro, but unlike Adcock, he is nervous about the adjustment. Varsity boys head coach Thomas Waller doesn’t think any of the three will have too much of a problem adjusting but stressed that they will still have to adjust. Both Coach Waller and Coach David Olorunfemi have been instrumental in preparing the three athletes for the next level. “[The coaches] just teach you what you need to work on in the game and you just go to practice, work on it and improve,” Adcock said. Maupin said that Coach Olorunfemi’s words always had an impact on him. Coach Olorunfemi, Coach Waller and the three athletes got to know each other well during their time together at Grady. Coach Waller had the opportunity to coach each one for at least a year and came to appreciate each athlete’s skill set. Waller was also complimentary of Maupin’s demeanor and his ability to be a leader as the varsity captain for the past two years. When asked about Adcock, Waller was quick to describe what stood out in the two years he coached him. Adcock and his athletic companions have taken beyond just scoring goals. They have also set goals that they wish to accomplish during their collegiate soccer careers. Adcock’s says that he aims to win the Division II championship for the University of West Alabama. Maupin has similar goals. Coach Waller is confident that his players will accomplish their goals and have a successful collegiate career. “It won’t take that long for them to get where they want to be because they want to be the best they can be,” Waller said.